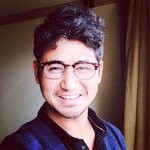 How Debt Affects Investment Returns? In this blog, we are going to look at an important aspect of any form of investing – Debt, also called Leverage, Gearing or simply a Loan. Any investment asset is it a Property Investment, Stock or Bond generates returns. Property in the form of rent and capital appreciation, stock in the form of dividends & stock appreciation and Bonds in the form of interest and increase in value. This return is independent of the way the Asset is financed. 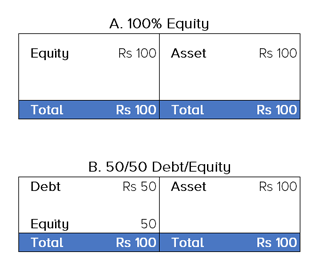 Whether the Asset is 100% funded by equity or 50% with equity and 50% with debt, the returns from the Asset will always be the same. What matters, however, is how this return is distributed among the various capital providers who have funded the Asset. For example, if a house costs Rs. 100 and returns 15% a year (Rs. 15) and is funded 100% by the buyer through his own savings (full equity), the returns will exactly match the returns from the Asset. The Lender’s return is independent of the return on the property whereas the Buyer participates in the upside as well as the downside in the value of the Property. Banks who provide home loans are not in the business of making 15-20% returns on their capital. They are happy with 10% but under less volatile circumstances. So when should an Investor take debt and how much? Mathematically, an investor should take a loan so long as he feels the Asset will return more than the interest on the loan. If the asset returns more than the interest, it will always be more profitable to take a loan. So then should you take 99.99% debt if the returns are higher than the interest rate? That brings us to the next question - How much of debt is good? Mathematically, one should take 99.99% debt if the returns are positive. But this creates an important anomaly in the risk-return matrix. The higher you borrow; greater is the risk you are taking. Let’s assume you buy the same property with 99% debt i.e. you invest Re. 1 and take a loan of Rs. 99. In this case, if the returns are Rs. 15, you pay the bank Rs. 9.9 (10%) and pocket Rs. 5.1 earning a phenomenal return of 510% on your Re. 1 investment. So what’s the catch? Yes, the Returns are not guaranteed. They are volatile in nature. That’s what makes investing so interesting. If the house returns 5%, the Buyer will still have to pay Rs. 9.9 to the Lender, which means he has to pay the bank an additional Rs. 4.9 from his own pocket implying a negative return of 490%. Additionally, since the Buyer has so little skin in the game, the likelihood of him defaulting is very high. A Buyer would rather walk away from this property than pay the Rs. 4.9 because he has only invested Re. 1. This simple concept led to a very big crisis in 2008 – The Sub-Prime Crisis, where losses reached $10.8 trillion, Americans lost 25% of their net worth and the stock market fell 45%. American investors indiscriminately purchased properties when house prices were increasing year on year while banks grew bolder and bolder and provided loans of up to 99% to sub-prime borrowers. When housing prices started falling, the same borrowers defaulted en masse leading to the biggest crisis of the 21st century. So How Much of Debt is Good? The Optimal debt strategy varies partly from individual risk-taking ability and how much the banks are willing to lend. In India, banks lend up to 80% in case of home loans and 66% in case of commercial property loans. At Property Share, we believe optimal debt lies somewhere between 50% and 66%. This leaves enough leverage benefits for Buyers and a healthy downside protection for Lenders. 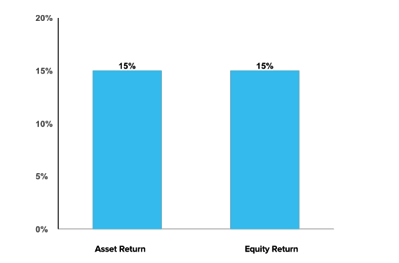 On our debt platform, we rarely exceed 50% loan-to-value (LTV) providing a 50% cushion for Lenders and a chance to double their returns for Equity holders. So, the next time you are faced with the Leverage question be sure to follow these simple concepts. You can become a Lender or Borrower in our properties by clicking on the button below.